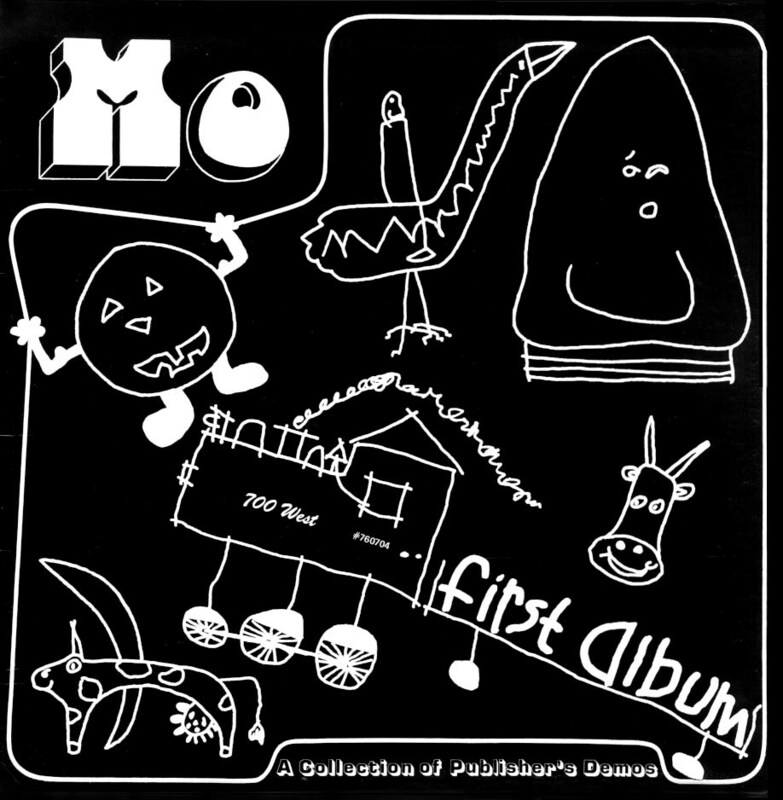 2015-09-14: The Amazing MO's First Album from 1976 -- highly recommended! 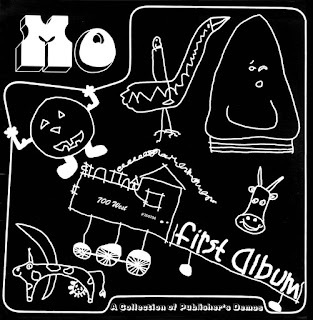 The Amazing MO's First Album from 1976 -- highly recommended! 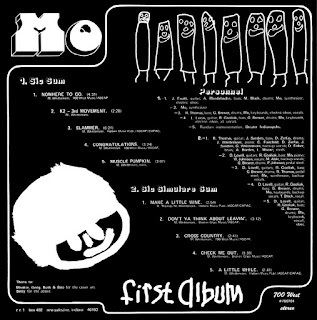 This astonishing album is the creation of a relatively unknown genius named Moe Whittemore, who also founded the studio 700 West in New Palestine Indiana. Notice they released the 1976 Sailor album I featured recently this summer, plus other famous unknown progressive gems. That Maelstrom Paradigm album from them, for those who have heard it (I don't actually recommend it) is absolute atonal progressive noncommerciality, showing the artistic dedication of this particular studio head. "Moe Whittemore's first and only album on his own 700 West label is one of Indiana's oddest left-field rarity. 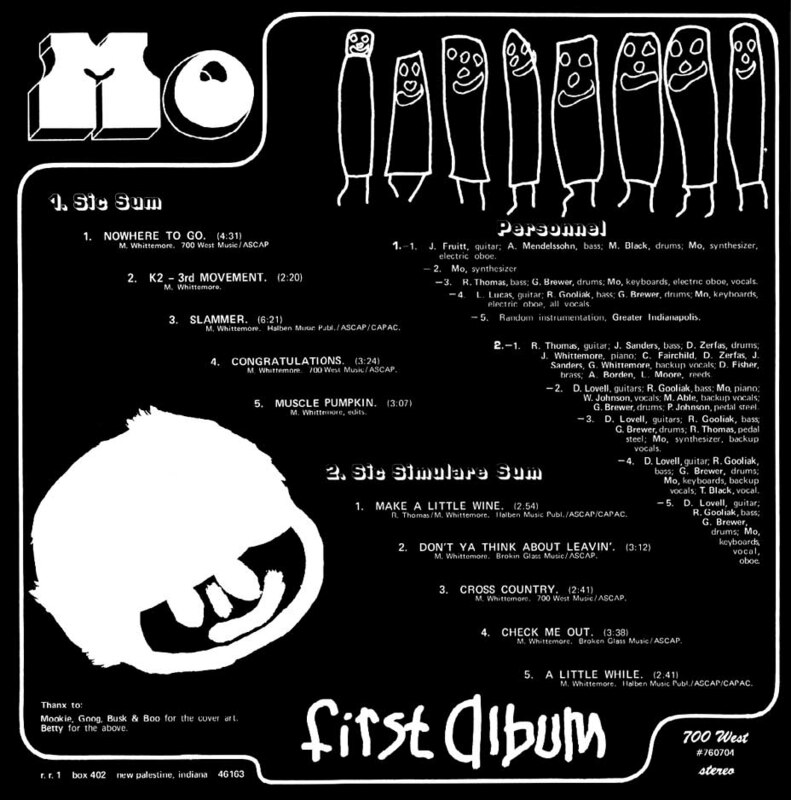 Ostensibly a selection of publishers demos, the album was rumored to have been printed in a very small run of only 300 copies. The style runs the gamut from beat-heavy progressive rock on "Nowhere To Go" and "Slammer" to futuristic space noodlings on "K2- 3rd Movement" [Actually a chamber music composition clearly, but played on synths]. The final track on side A -- Muscle Pumpkin is a thinly veiled ode to Captain Beefheart sounding like a Trout Mask Replica attack complete with choral background singers and Ornette Coleman oboe (courtesy Mo) [that oboe actually appears on Congratulations, not that song]. The flip is dominated by more "normal" songs, including drum-heavy "Make a Little Wine" which saw some local airplay as a 45 rpm release back in 1976. Two country songs follow. Anthony Black of Lamp Records fame (Tony Black and the Revolution) provides vocals on the sweet soul masterpiece of Indianapolis -- "Check Me Out." All in all, the album is something between a demo to promote his recording studio and a library record of styles. Absolutely recommended to beat heads, library collectors and psych fans." Oh yes, it's absolutely recommended, all right! As he intimated there are a couple of throwaway tracks (to me) including the song about making wine (a side occupation of Mo's apparently, probably within the studio). For me the song "Congratulations" just takes it over the top with Zappaesque humour and satirical lyrics, far exceeding the tongue in cheek of Brustna's similarly themed song (Stupid Record Company) about commercial success (or Pink Floyd's Welcome to the Machine from 1978's Wish you Were Here). Pay attention to the spoken voice saying near the end: "That's probably one of the best songs out there right now!" and the silly deejay voices: "REO Speedwagon!!" But all the lyrics are well worth discerning here. That high pitched instrument that sounds like a bagpipe, I take it, is the oboe mentioned by the reviewer. Or try to follow the sheer bizarreness of the melody of track 10, "A little While:"
Now that's the kind of song I wish I could hear on the radio or at work!! When you consider that this is ostensibly a sentimental love song, imagine how appealing it would have been for the poor receiving female to hear, especially when it transforms half way through into an uptempo jazz improvisation. Utterly demented.